There are several thousand trees growing at Truitt's Christmas Tree Farm. The predominate variety is Leyland Cypress. A number of years ago, Georgia Christmas tree growers thought they had found the perfect christmas tree with the Leyland Cypress. It has qualities like no other tree; lush, green foliage, needles that remain on the tree and longevity if properly watered. Seen by thousands of customers of Georgia Christmas tree farms, the beauty of this tree has propelled it to number one in sales on Christmas tree farms and in the nursury industry. The Leyland Cypress is now planted all over Georgia's landscape. Truitt's Christmas Tree Farm is currently transitioning from the Leyland Cypress to the Murray Cypress because while maintaining some of the same beneficial characteristics of the Leyland Cypress such as shed resistance and long life, the Murray Cypress has stronger branches and a pleasing alpine aroma. This tree was discovered by Bill Murray, a retired Forester, while taking cuttings for his nursery. Murray, who was instrumental in the formation of the Georgia Christmas Tree Association and the Christmas Tree industry in Georgia more than 50 years ago, noted that this tree, the Murray Cypress, has desirable qualities beyond the original Leyland Cypress in that it is darker green and has stronger limbs for holding ornaments. For tree growers, it is almost unbelievable that the Murray Cypress grows faster than the original Leyland Cypress, which averages as mush as 4 feet per year. It is more disease resistant, will tolerate wetter soil and has a stronger root system. It has taken time to get the numbers of rooted cuttings to a level so the Murray cypress is widely available. As time goes on, this tree will be as readily available as the Leyland cypress is currently. This close up allows you to see a Murray Cypress branch. A Precious Christmas Memory awaits you and your family as you walk together through Truitt's Christmas Tree farm . Christimas Tree heights range from four to twelve feet. Some seasons provide for a thirteen to fourteen footer being offered. 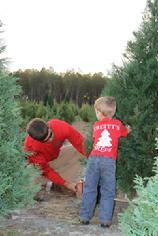 The most common tree height found on Truitt's Christmas Tree Farm is seven to ten foot. The Carolina Sapphire Tree was developed in 1968 at Clemson University. They have a steely blue green color, dense lacy foliage and tiny yellow flowers. The aroma is a mix of lemon, lime and mint. The seed cones are round, about 1/2 inch in diameter. Most years Truitt brings in some daily cut trees from his second location in Screven County, Georgia to suppliment his large tree selection.